How good is your favorite Fashion Blog? Find out: My.ComMetrics – rankings. PS. 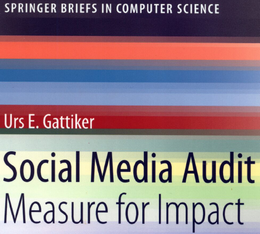 Much of this blog entry was inspired by Urs’ attending of the Monitoring Camp Hamburg – #moca12 – see also: Facebook Seite & Blog: Akzeptiert Marketing die Corporate KPIs? Which blog should I spend money advertising on? A while back I added a posted something titled, Is YOUR blog a failure? This post is part of a series of posts about the ComMetrics Footprint, which we calculate using a blog’s data (see My.ComMetrics.com). Here we share some things we have discovered analysing a few blogs and seeing the effects when things go wrong. By the way, sign up for our blog – it is FREE! Get future instalments of this series first. Magazines compile lists because people like to read them. Things are not that different for bloggers, with numerous rankings available, as we discuss below. This image illustrates some of the challenges we face as readers with rankings offered about certain web properties. The company produces a ranking for several countries and lists them on different websites (i.e. the German one on its German webapge). What were the criteria used for including these blogs? Why is one better than the other (such as Les Mads versus Stil in Berlin)? What were the exact criteria used to rank the blogs that were included in the database used? In the above case, I was unable to find any answers. Reading the byline makes clear that one’s inclusion and rank in the list depends exclusively on Alice Fisher’s personal preferences. Interesting as such rankings might be, you probably do not want to use them to decide where to place advertising for your cocoon-like yet elegant Winter 2013 outerwear line. Deciding which blogger to invite (all expenses paid) to the next fashion event where your latest outerwear will be presented also requires a little more deliberation. Other bloggers that provide rankings list criteria relatively nonchalantly (see below). I am not sure how creativity was measured, and while frequency of posts is an interesting choice of criterion, should that decide whether a blog is number one? I agree with Financial Times fashion editor Vanessa Friedman: “If nobody talks, there is nothing to talk about.” Nevertheless, before we spend advertising dollars based on rankings of fashion, insurance or other blogs, we need to address and talk about a few things. 1. What criteria were used to rank a set of blogs? 2. Why were the criteria used chosen (i.e. pageviews are not necessarily page views, and hard to measure right)? 3. What other criteria might be used to include or exclude a blog? While seeing a blog rank high in a list might make us feel like a dog when it falls in love and wags its tail, we may need some peace and quiet to relax and reflect. How useful are such things and how much should they guide our decision making about advertising or providing sponsorship, etc.? And just because somebody claims to have produced the leading and most trusted fashion blog rankings in the world does not make it true or helpful when making decisions about which blogs to read. a) What is the best ranking that you have come across recently? 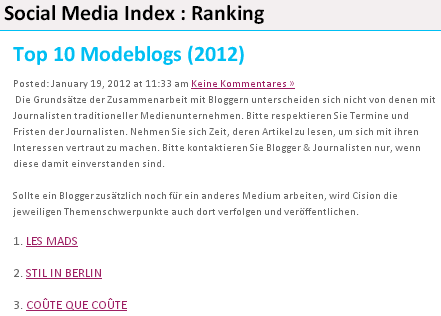 b) What advice could you give on how to use such rankings for advertising purposes (where to spend money on which blog)? 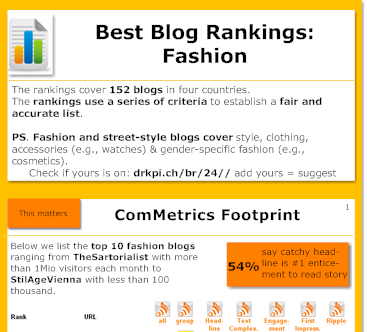 Source: @ComMetrics | Are blog rankings just distracting? Previous post: Are Google and Yahoo failures? Next post: Have any rankings to be proud of?